Roseau, Dominica – January 16, 2008……………….. There is a revolution now taking place in the education sector in Dominica. Prime Minister, Hon. Roosevelt Skerrit made the announcement at the twenty-fourth inaugural meeting of the Vieille Case Village Council recently. In his address the Prime Minister impressed upon the parents in the community of the importance of having education as a major priority for their children. Hon. 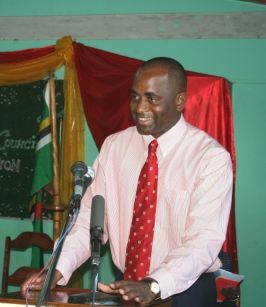 Skerrit, a former College lecturer recalled how many children from Vieille Case did not attend a secondary school back then, “not because we were not bright, not because we did not pass the Common Entrance but because we were engaged in a competitive environment which allowed for only a few of us to have access to a secondary school”. ” Today, from 2005 through the efforts of the Ministry of Education and the Minister and the Government of Dominica, every single child from this village who goes to grade 6 has a space at the Portsmouth Secondary School,” Hon. Skerrit stated. During his address the Prime Minister also highlighted the fact that record numbers of Dominican students are now pursuing tertiary education. “When I attended 6th Form College from 1990-1992, there were only two of us from the village at the College. Today we have several of our young persons who are sitting at the State College , who are doing Nursing Programmes and various other programmes at the Dominica State College because there is a revolution in education to allow for more of our children to have access to tertiary education,” the Prime Minister emphasised. The Prime Minister stressed that the opportunities for Dominicans to pursue university training came through the sterling efforts of his Government. “These opportunities did not come because we sat on our laurels, and hoped and prayed that somebody would offer us a scholarship. It came through the Government going out there and negotiating for scholarships. And every Minister of Government who goes out there, the first item on the agenda is scholarships,” Prime Minister Skerrit stated. Hon. Skerrit also revealed publicly for the first time that the Government of the Bolivarian Republic of Venezuela had increased the number of university scholarships available to Dominicans from 50 to 100.